Another post showed a Pacific Tree Frog (Pseudacris regilla) that had changed color, in 6 hours or so, from chocolate brown to tan. Today, in the same location—on our porch between the wall and a cardboard sixpack beer carrier—we found another (or maybe the same, who knows?) Pacific Tree Frog with distinct reddish color markings. Here he is, shy fellow, looking out at me. This is the most common frog in our area, found from British Columbia to Northern California, and up to 11,000 feet in elevation. And they’re noted for color changing, “ranging from unicolor to mottled with greens, tans, reds, grays, browns, or blacks. They have the ability to change from light to dark”. They’re in the “chorus frog” group. During breeding season, males will call to attract females. A number of calling males is known as a chorus. A dominant male, or chorus master, leads off the calling which is then followed by subordinate males. If an intruding male comes instead, the Pacific Treefrog changes its usual two-part “ribbet” to a one-part encounter call. An observer trying to locate the Pacific Treefrog can mimic their calls and take over as chorus master, enticing the other frogs to begin calling as well. If this is done, be prepared to take on the responsibilities that come with being the chorus master! I suppose they are the frog we hear so much in the spring, though I haven’t gone out to check; approaching calling frogs seems to make them be quiet, a very sensible move, so I haven’t pursued the matter. Great sound! And their color changing is really intriguing. Source for both, Wikimedia Commons. But the color-changing, apparently back and forth among all the colors except blue, is really intriguing. 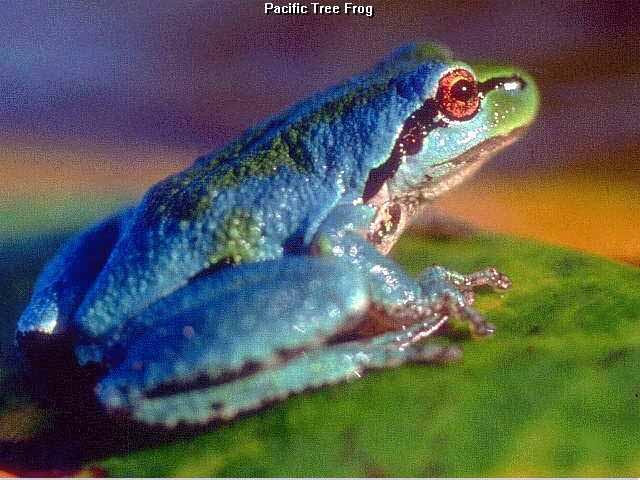 Wikipedia says, “Previously, it was thought that there were two different fixed colors that an adult tree frog could be. Now it has been found that some of them are able to change between the two.” The closer we look, the more complex things become. Wonderful! A new blog: challenging, like a white sheet of paper. Does the world need another blog? No. But blogs rise out of people’s need to say their piece––whether by a subject-oriented blog on science or politics, or a more personal, less link-laden, blog. This one will be some of each.There are subjects I have personal experience with, for which I’ve searched in vain online for the information I needed, and I’d like to address those. For example, methadone and chronic pain: the good, the bad, and the withdrawal. Or the current antipathy of many Americans toward the entire idea of taxation; my county’s entire library system closed for 7 months in 2007 for lack of money, and 2 modest tax levies to re-open the libraries failed during that period. Are we really too poor to support libraries? 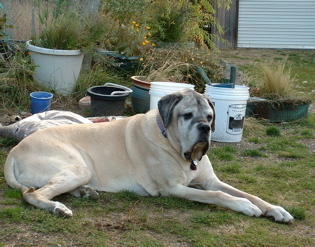 The dog on the masthead is our English Mastiff Bart, an old guy of ten. I’m afraid he does snore (a comforting sound, actually) but he never lies. Here’s another picture of him and one of Brook our Rhodesian Ridgeback.